Many of you remember our frustration with the current siren system. We vented (cough) more than a few times about it on Twitter and wrote a tl;dr position paper (below) about sirens in the context of the November 18, 2017 tornadoes. It’s now spring and here we are in the middle of tornado season, so I thought we should check in with the City Councilman who initiated the political process of modernizing Metro’s sires, Dave Rosenberg. NSW: Who are you, what part of the city do you represent, and are you the hero who sponsored legislation with the Metro City Council to address the siren issue? Dave: I’m the Councilman for Metro Council District 35, which covers much of the greater Bellevue area. I’ve been working with the Office of Emergency Management and the Mayor’s Office of Resilience with the support of many of my colleagues to modernize our tornado warning sirens. NSW: What’s involved in the process, where are we with it, and what exactly are you trying to do with the sirens? Dave: First, we needed to identify exactly what issues we were needed to solve to protect public safety. It’s no secret that there’s a lot of frustration with Nashville’s tornado sirens. We on the Metro Council hear it a lot. A tornado warning on Percy Priest Lake triggers warning sirens in Bellevue, where it’s sunny, or a tornado warning in Ridgetop triggers warning sirens in Antioch, where it’s a garden variety rain shower. Those false alarms breed complacency and that’s dangerous. We want folks to recognize that a tornado siren means you’re in danger and you need to take action. It’s confusing when the National Weather Service and local media say there’s no tornado warning in one part of Metro, but our old system still has all sirens going off. OEM has done a great job of managing the system we have in place to protect public safety, but technology has evolved and we have opportunities to do more. We need to equip OEM to modernize. We had lengthy conversations about how to move forward, with the main options being a) breaking the county into zones and only triggering sirens that could be heard in those zones, and b) getting even more precise by using the National Weather Service’s warning polygons and only triggering sirens that can be heard within those warning polygons. We ultimately settled on (b) because it will be quicker for OEM to activate and will offer even fewer false alarms. Next, OEM did a lot of research to determine exactly what costs implementation would include. And we learned that some of the current equipment is reaching its end of life, so we’d need to spend some money soon anyway. That’s where we are now. We’ll need to secure funding in this year’s capital spending plan, which will be a collaborative process between Mayor Briley and his team and the Metro Council, particularly Budget & Finance Committee Chair Tanaka Vercher. An allocation of $542,500 will cover all electronics and batteries in our 93 siren control cabinets along with two new control points with polygonal alerting capability at the OEM Operations Center. If we can get those funds, Metro will be able to get started. NSW: When will we know whether we can get those funds? What’s the next step? Dave: The capital spending plan will probably be filed late this summer. Metro Council will debate that plan, make any needed changes, vote, and send it to Mayor Briley for his signature. The most immediate step is encouraging support for funding this modernization. If you’re so inclined, you can encourage Mayor Briley, your district council member, and the at-large council members to advocate for moving this forward. NSW: How do we contact council members? And who were the co-sponsors on the resolution moving the siren issue through the legislative process? Dave: Council members are listed at https://www.nashville.gov/Metro-Council/Metro-Council-Members.aspx …. If you don’t know who your district council member is, there’s a form on that page that allows you to find out using your address. We haven’t had any substantive legislation on the sirens. We unanimously passed a resolution (http://www.nashville.gov/Metro-Clerk/Legislative/Resolutions/Details/fc01a928-815a-40c8-a9d5-8eebf570b50f/2015-2019/RS2018-1037.aspx…) asking OEM to look into the feasibility of modernization, but that was really just an effort to ensure we didn’t let time slip away. There is widespread support on the Council for upgrading, as you’d expect. We passed around a survey asking whether members preferred the current system or the proposed system, and it came back 23-2 in favor of modernization. NSW: Excellent. Thanks for your work. We’re hoping we can modernize our system the way Oklahoma City and other tornado-prone cities have. It’s great to see the council hearing the needs of the people and responding so they can equip OEM with what they need to best serve the public. Thanks for answering these emails, and we’ll check back in a few months to see how it’s going. Dave: Thank you for your support of this effort and all you do, not only to keep us all weather-aware during events at all hours but also to help spread understanding of the issues surrounding our community’s always-interesting weather. Tornado siren modernization is a worthy endeavor, second only to the regular distribution of West Wing GIFs, and your focus on both has been very helpful. End of the conversation. Below is our case for siren reform. they should not be your primary tornado warning source. Get a NOAA weather radio. Get a wake-me-up and wow-that’s-loud warning app. Have multiple reliable ways to get tornado warnings. Do not rely only on sirens. Below I argue Metro Nashville should at least study, and at best change, its policy of sounding all 93 of its sirens when a Tornado Warning has been issued for any portion of Davidson County. Instead, sirens should only sound for those inside the warning polygon. In the 1960s, Nashville (with some federal money) installed less than 20 sirens when we feared communists would attack us. These were Cold War Sirens, part of a defense “air raid” siren system referred to as “CDS” (I assume that meant Civil Defense System). Those Cold Warn/CDS sirens were silent as the Nashville tornado approached Centennial Park on the afternoon of April 16, 1998. There, Memphis resident and Vanderbilt ROTC student Kevin Longinetti was with his classmates. Tornado winds knocked down a tree, which struck Kevin. He died as a result. Those at Centennial Park weren’t the only people outside and unaware. Channel 5’s video, looking out at James Robertson Parkway, shows the tornadic supercell approach while people walk down the street going about their day, seemingly unaware, walking casually and without alarm (until it got really, really close). There was no siren there to alert them. Could they have seen the tornado coming? Probably not. Many Tennessee tornadoes are wrapped in, and obscured by, rain. Hills, trees, and buildings block view of the horizon. Our tornadoes frequently have low cloud bases, meaning they don’t tower majestically like tornadoes you see on Discovery Channel, on YouTube, and in movies like Twister and Sharknado. And, not all our tornadoes are backlit by daylight. We lead the U.S. in percentage of tornadoes occurring at night (45.8%). No matter the time of day, it’s unlikely you can see it coming, and if you wait until you hear the tornado’s roar, it’s already too late to take cover. I wasn’t in Centennial Park on the afternoon of April 16, 1998, but I’m willing to bet good money if you looked west from there, from downtown, or from countless other places in Nashville, you could not tell that inside that approaching giant low cloud was a tornado. Even those in a tall building with a really good look at it weren’t really sure what exactly that was. So why weren’t the Cold War/CDS sirens blaring on April 16, 1998? Kevin’s mother asked that question. She sued Metro for not sounding the Cold War sirens to alert those at Centennial Park — her son among them — of the approaching tornado. Metro’s response to the lawsuit explained why the sirens had been deactivated. (Affidavit of Jim Bowden, para. 8, Slepicka v Metro, Davidson County 6th Circuit Court, No. 99C-1041). How was NWS going to alert everyone? Weather radio. Remember, this was 1998. So, why am I bringing up this lawsuit? Two reasons. First, the lawsuit illustrates why we need an outdoor warning system. You’re probably aware I have been critical of Metro’s Office of Emergency Management’s (OEM) current siren policy, but let me be clear: I am not tossing rocks at OEM. I think I can say, safely, we agree an outdoor warning system makes sense. We don’t want another fatality or serious injury. We owe that much to Kevin, his grieving mother, and his family. And we owe it to each other. We are a community of musicians, students, health nuts, goat yogas, sports nuts, cyclists, crane operators, boaters, unicylers, motorcyclers, coaches, players, you name it, we do it outside. Safety is my #1 priority, too. What we have here is a disagreement about what’s best. We are much better detecting tornadoes now compared to 1998. Since that lawsuit, there have been advancements in radar technology to assist forecasters in issuing warnings. As in, seriously good advancements. The radar scans the skies more often. Radar isn’t “live.” Radar illustrates still images of what’s in the air (rain, wind, etc). In 1998, radar scans came every 5-6 minutes. Today we can get a new low-level scan every 60-90 seconds. That’s 4 to 5 times more information that we got 20 years ago. Radar detects rotation at a higher resolution now than it did in 1998. We can identify tornado debris on radar to confirm a tornado has occurred and is likely ongoing. No way we could do that in 1998. We know so much more about tornadoes now. Research has translated into actual, practical advancements in the field. The software is better. The training is better. The forecasters and warning decisionmakers are better. We have not figured it all out (the QLCS problem is discussed below), but the weather enterprise is warning tornadoes better today than it did in 1998. There’s a better network of storm spotters providing “ground truth” to assist warning decisions. Your #tSpotter reports are part of that. Advancements better identify the strongest tornadoes. The probability of detecting an EF-2 or stronger tornado on radar is very, very high. That wasn’t true in 1998. Before October 1, 2007, if any part of a tornado-producing storm touched any part of your county, the NWS issued a Tornado Warning for the entire county. This old system sent people to shelter who did not need to get to shelter, causing them to not believe the warnings they were getting. It was a bad system. People resented the unnecessary interruption in their day. Tornado detection was improving. It was time to end the overwarning era. This report, published by NOAA (NWS is part of NOAA) in March 2007, concluded NWS should abandon the system of county-based overwarnings in favor of a storm-based warnings. This was implemented October 1, 2007. In 1998, alerts could come from air-raid sirens or a NOAA weather radio, and maybe a scary sound on your TV. That was it. Today, access to media and alerts are at an all-time high. WEA alerts — the thing that makes your phone freak out — are used by mobile phone carriers. Social media and apps distribute information and alerts. Most have a mobile phone in a purse or a pocket, making the warning system personal and portable. This new technology works off the NWS storm-based/polygon-based system, not the only county-based system. So when NWS issues the warnings, phone alerts follow the NWS system. 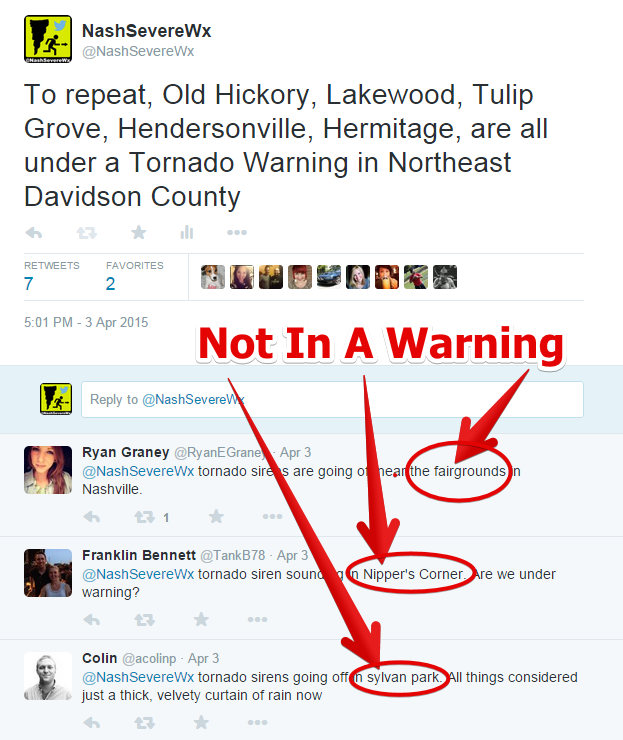 TV meteorologists follow NWS warnings. Apps use NWS alerts. Everyone’s in line, except Metro’s tornado sirens. The sirens themselves are pretty good. I’m glad we have them. Metro has done a good job keeping them working. That’s my issue: “any portion of the county.” That’s the legacy system, what NWS did before October 1, 2007. Metro’s policy is outdated by 10 years. It’s not just about you, Metro OEM. You and many other emergency managers around the country are fighting politics, budgets, and rapidly evolving population centers. We are singling you out here, yes, but this hasn’t been just a Metro problem. Here’s a sampling over the years. I would like to hear someone explain why Franklin sounded the tornado siren tonight. The city was well outside the Warning polygon. The last three times Franklin has hit the siren it's been either too late or without an accompanying warning. The siren is sounding in Franklin, but the NWS has EXCLUDED Franklin from the Warned Area. There are NO Tornado Warnings in Davidson or Williamson Co. If you hear a siren, I don't know what to tell you. A few Twitter *cough* exchanges between us and the City of Franklin prompted them to change their policy and only sound the City’s sirens when included inside the warning polygon. Williamson county (outside Franklin or Brentwood) uses a zoned system (if the polygon covers any part of a smaller “zone,” the sirens go off). It’s not perfect, but that zoned system is preferable to Metro’s all-or-nothing. Our siren policy drives me crazy. Warning canceled. They should not be sounding now, also should not sound outside the warning polygon. Metro’s sirens go off (1) where there is no warning and (2) frequently sound after the warning has expired and the threat has ended. Siren Fatigue means you hear the siren so much that you don’t immediately take life or property-saving action. Instead, you spend that time trying to see if the alert is legit, or, having been burned too many times by a false alarm, you ignore the warning altogether and go about your day, subjecting yourself to additional danger. Yet our sirens and NWS warnings aren’t redundant, they’re frequently contradictory. Sirens blare among the unwarned, and continue wailing long after the warning has been cancelled. 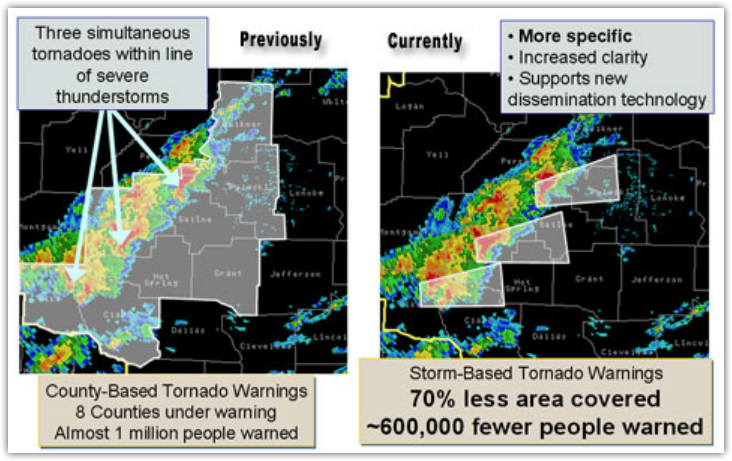 “Finally, the one common ingredient to a successful end-to-end tornado warning program is the personalization of the warning; to be successful, warnings must evoke a sense of specific and immediate risk. . . . Social and cultural factors may inhibit personalization of warnings. Long lead times and high false alarm rates tend to depersonalize risk.” That’s intuitive, right? Real world examples underline the Siren Fatigue problem. “‘The vast majority of Joplin residents’ did not respond to the first siren warning of the May 22  twister that killed 162 people because of a widespread disregard for tornado sirens, federal officials concluded in a report issued Tuesday. . . Officials didn’t blame residents, many of whom complained that sirens often go off in Joplin for tests or even just when dark clouds form, and suggested that a ‘non-routine warning mechanism’ be developed to make it clear when a siren should be taken seriously.” Read the full story here. The vast majority didn’t respond. Oklahoma City changed its tornado siren policy in 2016 so that their new message to the public is “that when they hear a tornado siren this spring, it’s time to take shelter,” not go and try to find more information or ignore it altogether. “Under [Oklahoma City’s] new tornado policy, sirens will only sound in parts of the city where a tornado threat exists rather than city-wide. The change means that residents who hear a tornado siren are in immediate danger,” said Lt. Frank Barnes, the city’s emergency manager. “Because the old warnings were so broad, many people either complained about being warned unnecessarily or ignored the sirens, Barnes said. . . It was very clear that they did not like the county-based warnings that they were getting and they wanted a more localized warning,” Barnes said. Reducing the size of the warned area saves money by not interrupting commerce. (Brotzge and Donner, The Tornado Warning Process: A Review of Current Research, Challenges, and Opportunities, Bulletin of the American Meteorological Society Vol. 94: , Issue. 11, : Pages. 1715-1733). Makes sense, right? If I don’t need to be taking cover, I could be working, learning, playing, whatever. So let’s talk about our latest tornado day and the problems it presented to the NWS (they issue warnings) and to Metro (they activate its sirens). There were two tornadoes in Davidson County. The tornadoes discussed below were embedded inside a squall line. Meteorologists call these storm lines QLCS, for quasi-linear convective systems. QLCS tornadoes can form anywhere inside the line and are often difficult to identify on radar; they’re different from supercell tornadoes where tornado detection is easier. Warning QLCS tornadoes is a big challenge for on-duty meteorologists. QLCS tornadoes are generally weak, short lived, they move linearly (they don’t wander), and may occur in between radar scans and thus never detected by radar. This is the next problem the science needs to tackle. The first tornado touched down in Joelton in northwest Davidson County at 4:29 PM as an EF-0, with damage mostly to trees. It then crossed I-24 as an EF-1 tornado with 105 MPH winds, causing roof and power pole damage, but no injuries. The Joelton tornado lasted 4 minutes and traveled 2.25 miles. Before the Joelton tornado touched down, the NWS office in Nashville issued a Severe Thunderstorm Warning with the qualification “tornado possible” in the text of the warning. No Tornado Warning was issued for the Joelton tornado, so Metro never activated its sirens. A second tornado (the “Gladeville” tornado) formed 19 minutes after the Joelton tornado ended, this time in extreme southeastern Davidson County near Percy Priest Lake, coming out of a different part of the line of the Joelton tornado. 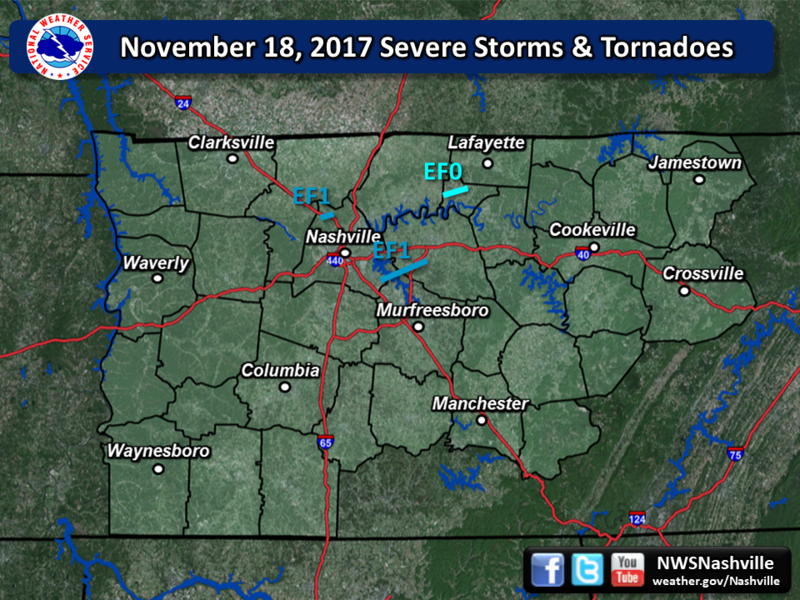 While in Davidson County, the tornado was weak, rated EF-0 (Will and I drove out there the next day). After a minute or so it crossed the lake and entered northwest Rutherford County, then streaked east-northeast and away from Davidson County into Wilson County, where it intensified into an EF-1 tornado and struck the town of Gladeville with 100 MPH winds, snapping trees and destroying outbuildings. Thankfully, there were no injuries. The Gladeville tornado was tornado-warned. NWS-Nashville timely issued a Tornado Warning for Davidson County, Rutherford County, and Wilson County. Unlike the Joelton tornado, the Gladeville tornado was clearly seen on radar, with rotation discernible via velocity data, co-located with a debris signature. The tornado was in Davidson County only a few minutes. (For a more complete review of these tornadoes, see our assessment). Consistent with its policy, Davidson County OEM sounded all of its 93 sirens for the Gladeville tornado. Of those 93 sirens, only 3 were close to the tornado in Davidson County. The remaining 90 tornado sirens alerted those outside the danger of this particular storm’s NWS-issued tornado warning polygon, effectively sounding an alarm to 98% of the county while they were outside the path of the storm. 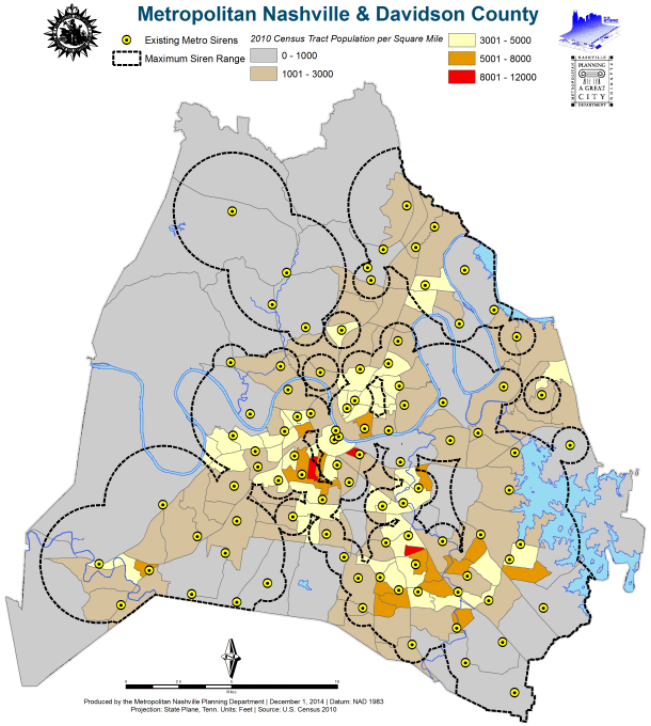 These sirens not only falsely alarmed the majority of the people in the county in a geographic sense, but they also alerted 100% of the population longer than necessary, sounding long after the storm left Davidson County and was clearly in Rutherford County, then Wilson County. Yet another example of overwarning. Another incident of Siren Fatigue. Complaints by the public, including councilman Dave Rosenberg, prompted media inquiry, an OEM response, and the Mayor’s office promising a review. In its November 21, 2017 press release, Metro justified its activation of “all of Davidson County tornado sirens because of the irregular movement of tornadoes.” Metro apparently trusts the NWS enough to wait to sound its sirens until a tornado warning is issued, but they don’t trust them draw the warning polygon big enough, fearing the tornado may wander out of the polygon. OEM should be — and is hereby challenged to — identify cases of QLCS tornadoes moving “irregularly” and out of the polygon and into an unwarned part of Davidson (or any other) County. This certainly did not happen November 18, or any other time we know of. There was no way either of the QLCS tornadoes were going to wander out of their polygon. Scholarship and peer reviewed science proves this “irregular movement” concern isn’t an actual problem. Speheger and Smith published an article in December 2006 On the Imprecision of Radar Signature Locations and Storm Path Forecasts. They concluded that “although precise, street-level locations of tornadoes cannot be determined, [tornado warning] polygons should be drawn to account for any error in radar interpretation or changes storm directions. If a tornado is suspected of developing outside its polygon, a new warning is issued.” That’s why the polygons are drawn as large as they are. It’s why warnings are frequently issued and updated. Speheger and Smith were prophetic. In one case, radar software failed to pinpoint the exact location of the killer EF-4 Tuscaloosa tornado on April 27, 2011. That software plotted the tornado a few miles from where it actually was yet — and this important — the tornado stayed inside the polygon. The potential for error was accounted for by the size of the polygon. When I first hear that I stopped cold. Wait. What? Is the policy to only warn when NWS issues a tornado warning, or is the policy to warn when “there is a significant weather event?” Which is it? OEM’s departure from policy only caused more confusion to those watching Davis Nolan. “Alert rather than get hurt” or “better safe than sorry” policy ignores the damaging impact of the overwarning/Siren Fatigue problem, discussed above. NWS recognized the danger of overwarning, so it changed the entire way it issues storm warnings more than 10 years ago. Studies confirm the intuitive: the more you sound a false alarm, the less effective the alarm becomes. Oklahoma City recognized this. They changed their siren policy and fixed its overwarning/Siren Fatigue problem. The City of Franklin changed. A confused public, in a moment of high stress, wonders what to do next. They turn to TV media, social media, and the NWS, hoping someone has anticipated and resolves their confusion about whether they should be taking cover. Those in the path of the storm waste time trying to figure out if they are actually warned. Those outside the warning polygon either take cover unnecessarily or ignore the warning altogether, and are more likely to delay their response next time. The task of unraveling the confusion falls on local media and the NWS at the worst possible time, taking away time better spent staying ahead of the storm. “We want everyone on alert in Davidson County,” says the OEM press release. Instead of alert, we have confusion and complacency. Instead of action, we have people wasting precious time seeking secondary confirmation before sheltering, or simply ignoring the warning altogether. We have two voices, not one. Tornadoes posing the greatest threat to life and property are often unmistakeable on radar. In the event we have one of these in Metro, we need clarity of message. We don’t need a population conditioned to seek confirmation when they need to seek shelter. We certainly don’t want anyone so desensitized to unnecessary over-warning to endanger their life because they’ve been ignoring the sirens and other warnings. Here’s a small sampling of the harm caused by Metro’s policy. “Not a single person cared that sirens were going off” is very concerning. I can see it prompting you to get further information, but ignoring sirens altogether is not what we want, and it’s not what OEM wants, either. The sirens should be part of the warning system instead of pulling against it. That’s a quote from Metro OEM. I think it’s fair to ask what study supports the status quo? Where’s the social science supporting Metro’s “alert rather than get hurt” policy? Is the study from Joplin wrong? Is OKC wrong? Are the above-quoted studies error? Has NWS’s move to storm based warnings been a failure for 10 years? Is OEM’s rationale documented anywhere? Have they commissioned a study to find out? Hello – Mayor Barry and our office will be comprehensively reviewing our current storm warning siren system to determine if adjustments can be made in a cost-effective manner while still encouraging resident safety. And it appears she is making good on it. All four chief meteorologists agree the current siren policy has real problems. I hope the Mayor’s office will take time hear from all four Chiefs and other dissenting opinions. I hope the Mayor’s office will demand studies justifying continuing the current policy. I hope the Mayor’s office will pursue the best science, or even commission a study, to determine what to do next. This has gone on too long. Let’s fix it.